In the current article, we review how to display information about deleted mail items, by using the PowerShell cmdlet – Get-RecoverableItems. The purpose of the PowerShell cmdlet – Get-RecoverableItems is to help us to display (view or even export) information about deleted mail stored in Exchange mailbox. As mentioned in the former article, the uniqueness of the PowerShell cmdlet – Get-RecoverableItems is, the ability to view info about “standard Deleted mail and in additional, Soft deleted mail items. 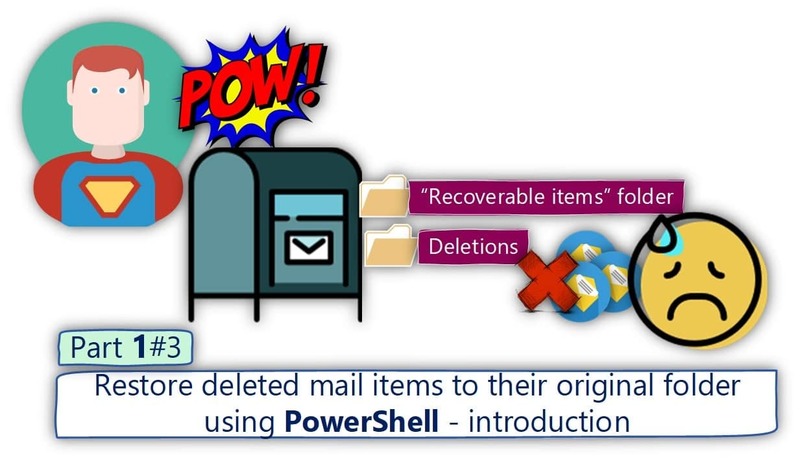 In the next article, we review the use of the PowerShell cmdlet – Restore-RecoverableItems that help us to restore deleted mail items of a specific Exchange mailbox. Standard Deleted items – the term “standard deleted mail items” is not a formal technical term, but instead, I term which I use for relating to mail items that are stored in the mailbox folder – “Deleted items” (the mailbox recycle bin). Soft Deleted mail items – mail items that were deleted from the mailbox recycle bin and classified as “Soft Deleted mail items.” These mail items are stored in the “Deletion” folder, a special hidden system folder, that is part of the “Recoverable item folder” space and store Soft Deleted mail items. Deleted items (recycle bin) folder. Deletion folder – the special hidden folder that is part of the “Recoverable item folder” space and store Soft Deleted mail items. Display Deleted mail items | Deleted mail items stored in the mailbox recycle bin folder. Get-RecoverableItems Jeff -FilterStartTime "9/1/2018 12:00:00 AM" -FilterEndTime "9/1/2018 12:00:00 AM"
For example, standard E-mail message, calendar meeting, task items and mail contact item. In case that we need to define a search filter that looks for a specific type of deleted mail items, we can use the parameter “FilterItemType”. By default, the PowerShell cmdlet Get-RecoverableItems display all the deleted mail items. The term “Last parent folder identity” define the identity of the Exchange mailbox folder that hosts the mail items before the mail items were deleted.